Galápagos – Santa Cruz Island : What to see? How do I get there? Free activities and much more! Santa Cruz Island : What to see? How do I get there? Free activities and much more! 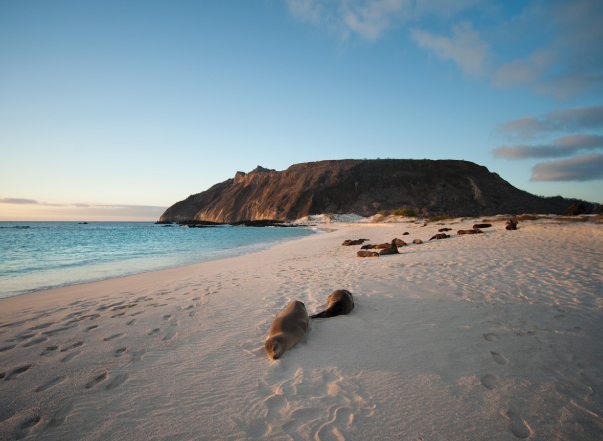 Santa Cruz Island in Galapagos is the most visited of the archipelago since most commercial flights from the continent land here. 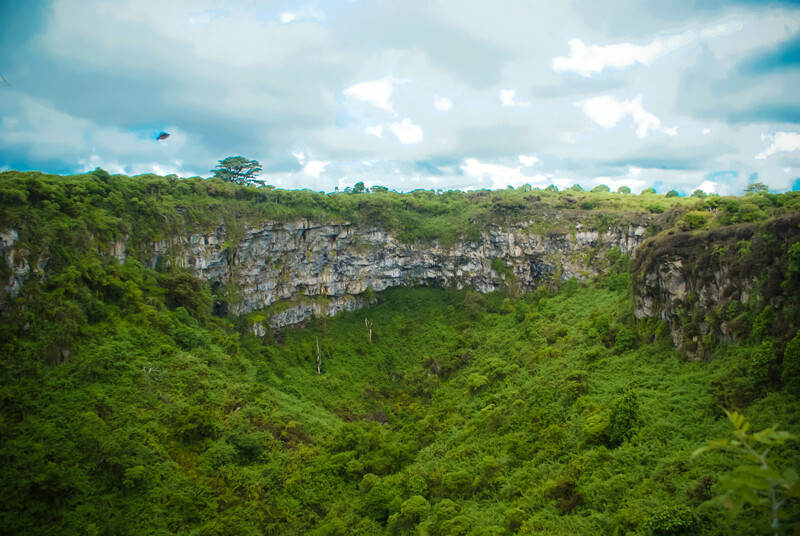 Although there are also direct flights to San Cristobal Island, tourists prefer Santa Cruz Island due to its central location with respect to the rest of the Islands, which allows you to explore the Galapagos Islands in a better way. Santa Cruz is also the most populated island and therefore we could say that the most “civilized” in comparison to the other islands where you can still live a paradisiacal calm. In Puerto Ayora, the capital of Santa Cruz, you will find much commercial activity, traffic, hotels, bars, restaurants, shops and ATMs (which are not yet available in other islands). 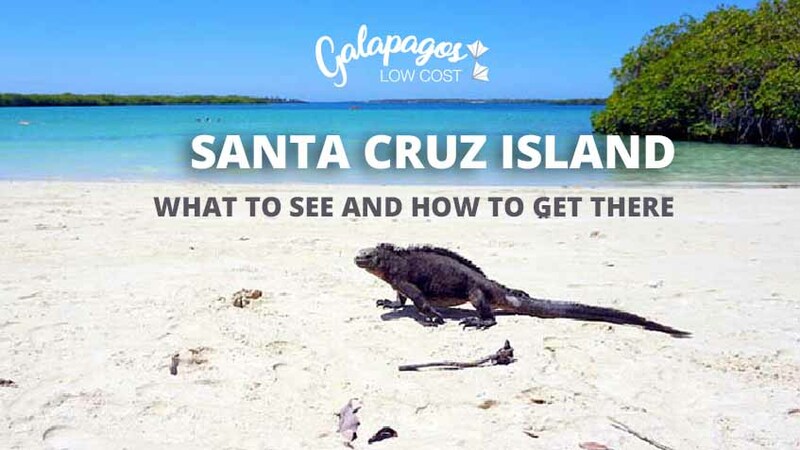 Perhaps the first impression makes Santa Cruz look like a place too cosmopolitan to be in Galapagos, but the reality is that it is only a small part of the island. Santa Cruz has a lot to offer: incredible landscapes and activities that are also free. Here we tell you everything you need to know to know her well. How to get Santa Cruz island? The airlines that fly to Galapagos from mainland Ecuador are LATAM, Aerogal and the local company TAME. There are direct flights from Guayaquil and Quito to Baltra every week. It should be noted that the flights are not specifically to Santa Cruz Island, but to Baltra, a small island attached to Santa Cruz where only the airport is located, it is not inhabited and there are no hotels, the only purpose of the island is to house the airport. Once you have landed at the Baltra airport, you will have to board a bus to transport you to the coast of the island, where a ferry (USD 0.60) will cross you through the Itabaca channel to Santa Cruz Island. The crossing does not end here, when you have crossed that small piece of sea and finally arrive to Santa Cruz, there you will be waiting for taxis (white Toyota trucks, do not wait for a yellow car) that will take you to the capital of the island, Puerto Ayora, where the activity is concentrated and where the majority of hotels are located. This journey can last around 35 minutes and cost about $ 30. The most economical and practical option to move between the main populated islands (Santa Cruz, Isabela, Floreana and San Cristobal) is in the water boats that depart daily from the port. The price for each boat trip is around $ 30 and usually lasts 2 hours, depending on the route and maritime conditions. 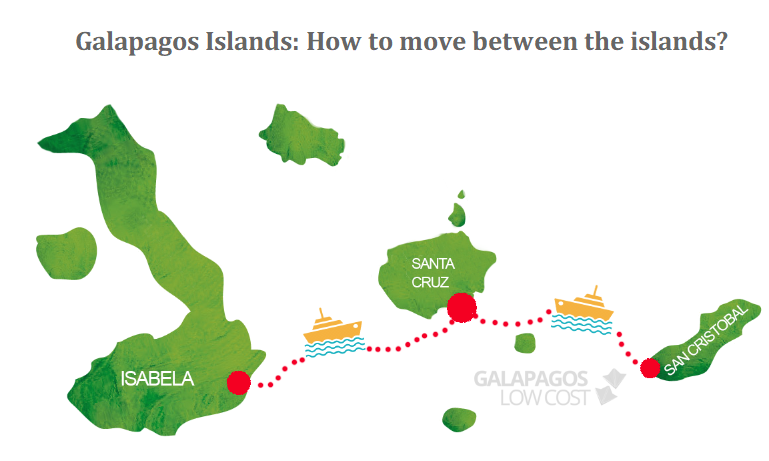 Remember that there are only two departures per day at a specific time on each island, so you will have to consider your departure and arrival times to plan your activities in the Galapagos Islands. If you are in San Cirstobal and you want to travel to Santa Cruz, these are the departure and arrival times of the water boats. Our goal is that you can enjoy the magic of the enchanted islands without spending too much money. That’s why we tell you the free plans and low cost activities in Galápagos that you can not miss. 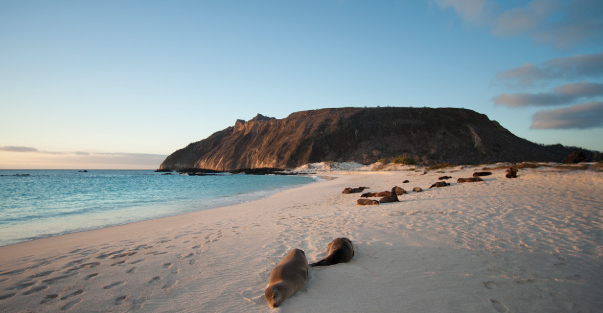 The most famous beach in the Galapagos and the 10 best beaches in the world. Tortuga Bay is an amazing place and best of all: it’s free. Of course, the price ou have to pay will be physical, since to access without paying you will have to walk around 2 miles. The road is a bit long and tired, but the reward of seeing the turquoise sea at the end makes it totally worth it. What you will see upon arrival is Playa Brava and as you can guess by its name, it is an ideal beach to surf for its powerful waves, but not for bathers. So enjoy a little of the view and then continue walking to the right, to the extreme. There you will find a natural pool where you can swim and if you have your own snorkeling equipment you will see turtles, sharks, rays and hundreds of fish. The best thing about this beach is not the landscape, nor the colors of the sea, nor the white sand; The best thing is that you can enjoy all that without sharing it with anyone because there are almost no people. Of course, when we say that there is no one, it means that there is no one, no locals, no street vendors or stores; so as we mentioned at the beginning you will have to be prepared with water to drink and eat if you plan to spend a lot of time there. This beach is open to the public until 5.30 pm so you should plan your visit with this in mind. Another way to access Tortuga Bay and save the walk is by boat from Puerto Ayora. The price is usually around $ 20 round trip. An ideal place to learn more about the history of the famous Galápagos tortoises, their discovery, evolution and of course, you can see their most famous specimen The Solitaire George. Las Grietas are located south of the island. 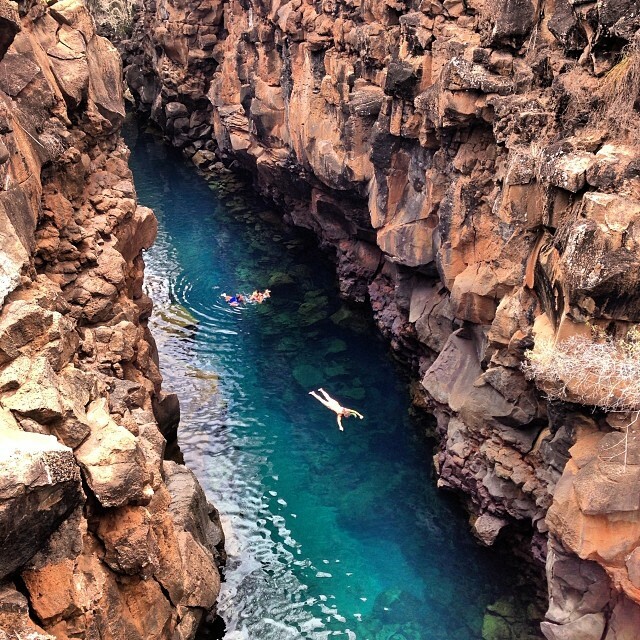 This place is a small channel between volcanic rocks where there is sea water and many fish. It is perfect for snorkeling or just spending time swimming in a pool of crystal clear water. Many locals also take advantage of the height of the rocks of this place to launch themselves doing different pirouettes from the top. To get to “Las Grietas” you must take a water taxi for $ 0.80 cents that will leave you very close to the entrance. Remember to wear sports shoes because the entrance is a rocky path. You can visit La Grietas for free! These three places are located in the upper part of the island, so we recommend you to do it at your arrival to Santa Cruz as they are on the road between the airport and the city. Los Gemelos are two craters product of the sinking of the earth after volcanic eruptions. They impress by their size and depth and can be seen in a quick stop to take some photos. 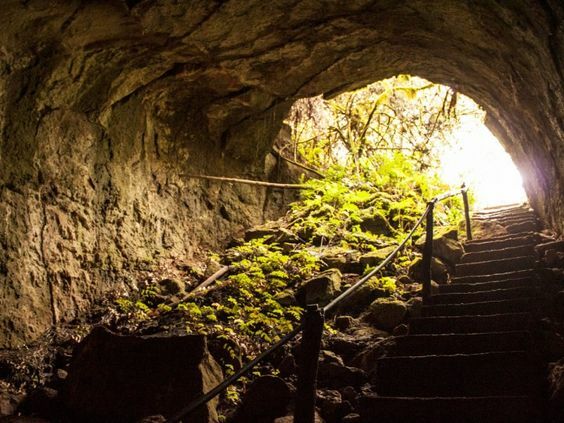 The lava tunnels are underground caverns of 400 meters left by the lava after its passage. You can also visit the Rancho Primicias where turtles are found in their natural habitat. The entrance to the ranch costs around $ 8 and you can enjoy a good breakfast or lunch. A beautiful lagoon surrounded by mangroves to enjoy a quiet walk in the afternoon. In addition to the free activities, Santa Cruz is a very good starting point to access daily tours to other islands or snorkeling tours in unique places. These are some of the most popular day and half day tours that will help you get to know the island better. This half-day tour takes you to know La Lobería named after the sea lions that are here, here you can snorkel with large and small sea lions. Continue the tour through the Canal del Amor, a place where nature lets us admire its beauty. At the end of this channel, a few meters away, there is a viewpoint where you can see white-tipped sharks and after a short walk we can see marine iguanas in the so-called Playa de los Perros where you will have time to snorkel surrounded by different reef fish , marine turtles, among other species. The tour ends in Las Grietas. This tour is the most popular on the island and is 3 and a half hours long. There are two departures a day: from 9:00 a.m. to 12:30 p.m. or from 3:30 p.m. to 5:30 p.m.
As we commented in the publication about Isla Isabela, to travel to Galapagos you have to prepare yourself. 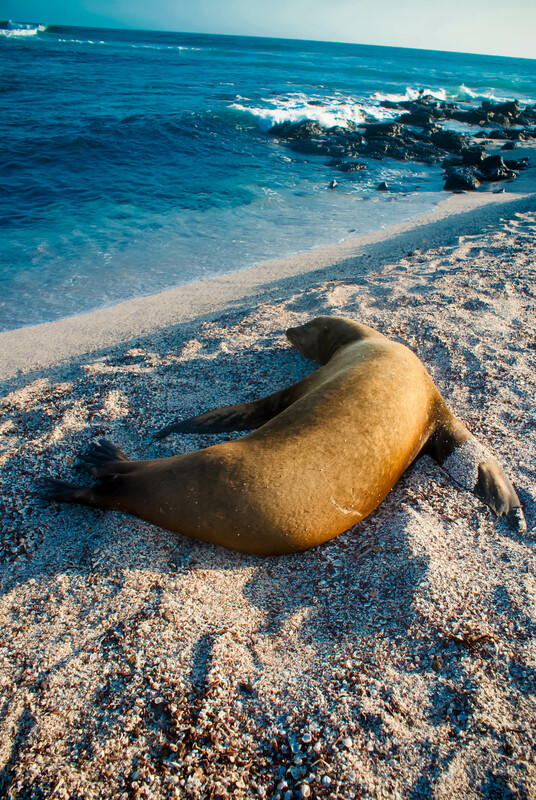 Before assembling your suitcase to travel to Galapagos, keep in mind that although these islands are a beach destination, the dynamics within Galapagos is not the same as what you would live in a resort beach since the conditions and the terrain are very different, that makes it a unique destination. Sunscreen: be aware that we are in the Ecuador, the sun hits very hard and not protecting you enough can ruin your trip.. Sneakers: although the beach is usually associated with the classic Hawaiian sandals, in Galapagos you can walk a lot through volcanic terrain, so good sports shoes will make your stay easier. Cash: ATMs are scarce in the Islands, in fact, on Isabela Island there are none. Go with enough cash to avoid financial inconveniences. Snorkeling equipment: although this is optional, if you have your own equipment you can snorkel by free and see wonderful marine species, also avoid using previously used equipment. Snacks: You can take this or buy it on the island in a small store. Remember that the beaches in Galapagos are usually isolated and there is no commercial activity nearby so if you are sunbathing in Tortuga Bay and you want to drink water or eat something, you will not find any chiringuito or shop in several kilometers around. Don´t forget to fetch the garbage of everything you bring. The Galapagos National Park is a protected area, which is why there are several common products that are restricted here because they can damage the balance of the ecosystem. You can consult the complete and updated list of restricted products in Galapagos here. Due to the central location of Santa Cruz Island, it is an excellent starting point to visit other smaller and less populated islands such as Bartolomé Island, North Seymour or to carry out experiential fishing on the South Plaza Island or to snorkel on Santa Fe Island These tours usually cost $ 100 and up but allow you to know less explored and unique places of the Galapagos National Park.